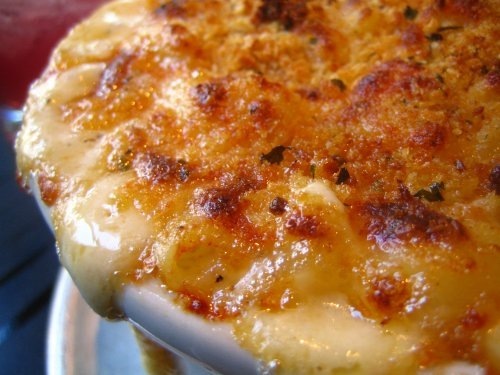 I’m putting this recipe up for those that have been looking for a Mac and Cheese recipe, with a béchamel sauce, instead of the version I prefer (The Lady’s Cheese Mac). heat. Add macaroni and 1 tablespoon salt; cook until pasta is tender. Drain pasta and set aside in colander. until mixture is steaming and heated through, about 6 minutes. brown, 3 to 5 minutes, rotating pan if necessary for even browning. stage. In fact, overcooking is better than undercooking the pasta. can be halved and baked in an 8-inch-square, broiler-safe baking dish. This entry was posted in Uncategorized and tagged Cheese, Grains, Potatoes, Pasta, mac & cheese, mac and cheese, macaroni, macaroni and cheese, recipe. Bookmark the permalink.